There's not an awful lot on the Internet or in grammar books on the inversion of conditionals, so I thought I'd take quite a detailed look at it, with plenty of exercises. How do we know when we can invert in real tense conditionals? Should you find the introductory exercises too difficult, or would prefer to go straight the explanation, you can skip (miss out) the first section. Look at this memo on the noticeboard of a block of flats, and try and find three places where conditionals are being used without if, and where the subject and verb have been inverted (have changed places) - hint - look for result clauses with will, would and would have. There is one in each paragraph. Then do the exercise that follows it. It seems there has been a problem with the heating in some of the flats. Unfortunately we have only just been made aware of this. Had we known earlier, we would have called in the technician immediately. Regarding the heating and other services, should anybody have any problems, please can they contact the building management immediately. We will then be able take action much faster. We have repaired all the existing faults, but were the heating to break down again, we would have to seriously consider whether it would be worth installing new boilers. 1. If earlier, we would have called in the technician immediately. Now do the same with this memo to the employees of a chain store. Note that some of the subjects and verbs are a little more complex. I regret to say that we have recently had to take disciplinary action against two employees for stealing company funds. I must remind you that should any member of staff be found to have been stealing from the company, they will face severe penalties. Unfortunately, it appears as though one of these employees was having some financial difficulties at home. As you know, we have special arrangements to help employees in such situations, and had the person concerned been to see Jennifer in HR, she might well have been able to help. I realise that conditions are difficult for many of you at the moment, and were any of you to find yourself in similar circumstances, I would strongly advise you to arrange to see Jennifer as quickly as possible. Inverting conditionals involves removing if and swapping the subject and auxiliary. Note - I say that Real Present / Future conditionals include some First conditionals because there are quite a few conditionals that don't fit into the classic pattern of First conditional that we can invert with should. On the other hand, there are a lot of First conditionals where we can't invert. We'll look at this a bit more later. The following exercises are all text entry. You don't need to add any punctuation. Real present / future conditionals, including First conditionals. Inverted versions start with should. So where needed, add should to the condition clause and change the verb to the bare infinitive if necessary. Remove if and invert should and the subject. If she sees Peter, she'll pass on the message. If she should see Peter, she'll pass on the message. Should she see Peter, she'll pass on the message. If they are interested, we'll send them a price list. If they should be interested, we'll send them a price list. Should they be interested, we'll send them a price list. Note - We can't always invert Real present / conditionals, but we'll look at when we can and when we can't a bit later. 1. If she arrives late again, she could face disciplinary action. , she could face disciplinary action. 2. Tell Paul to give me ring if you happen to see him. Tell Paul to give me a ring . 3. If you're interested, there's a good play on at the theatre tonight. , there's a good play on at the theatre tonight. 4. We can always employ extra staff if the need arises. We can always employ extra staff . 5. If you need any more information, don't hesitate to contact me. , don't hesitate to contact me. Inverted versions start with were. We can invert the verb to be and past continuous directly, but we must change was to were. With other verbs in past simple, we need to change the verb to the were to construction before inverting. If the government introduced this tax, it would affect a lot of people. If the government were to introduce this tax, it would affect a lot of people. Were the government to introduce this tax, it would affect a lot of people. We seem to be able to invert more or less any Second conditional in this way. 1. If he was more sensible, he would see what the problem was. , he would see what the problem was. 2. We would have to look for another partner if they refused to cooperate. We would have to look for another partner . 3. If you were promising us early delivery, we could perhaps increase our order. , we could perhaps increase our order. 4. If such a situation came about, the company could go bankrupt. , the company could go bankrupt. 5. The government would act to defend the pound if it was necessary. The government would act to save the pound . Inverted versions start with Had. We already have auxiliary had, so we don't need to add anything. We simply remove if and invert the subject and had. Inversion seems to work with all Third conditionals. If she had known how he would react, she would never have said it. Had she known how he would react, she would never have said it. 1. If she had been paying more attention, she would have noticed the red light. , she would have noticed the red light. 2. I would have brought a present if I'd known it was your birthday. I would have brought a present . 3. If the merger had gone through, it could have resulted in a lot of redundancies. , it could have resulted in a lot of redundancies. 4. He might have become a great musician if he had lived longer. He might have become a great musician . 5. If Japanese classes had been available, I would have taken them. , I would have taken them. Should she not phone soon, we'll have to leave. If he wasn't a diplomat, he wouldn't have immunity. Were he not a diplomat, he wouldn't have immunity. If he hadn't told me himself, I'd never have believed him. Had he not told me himself, I'd never have believed him. Had he not worked so hard, he wouldn't be where he is now. Were he not so lazy, he would have passed his exams. This is an idiom used to say that "somebody/something stopped somebody/something from happening" (Oxford Advanced Learner's Dictionary). 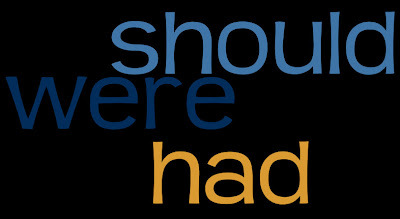 As in Second conditionals, we can use was or were (more formal). We can invert these expressions in the same way as with Second and Third conditionals. And as with Second conditionals, when we invert we must use were and not was. 1. If it wasn't for this appalling weather, we could have gone out. , we could have gone out. 2. We would have been here earlier if it hadn't been for the traffic jams. We would have been here earlier . 3. If it hadn't been for those extra lessons, he would never have passed the exam. , he would never have passed the exam. Somehow I'd be doing alright . 5. If it wasn't for his help, we'd never have managed. , we'd never have managed. Note - We have several expressions like this ending in for. There are except for and but for, as in the saying There but for the grace of God, go I which you might say when you see someone in a less fortunate situation than yourself, and which we could transform as If it wasn't for the grace of God, I would be in a similar situation. 1. If you bump into Mike at the conference, give him my regards. , give him my regards. 2. If we offered you the position, when would you be able to start? , when would you be able to start? 3. If she had passed her driving test, she could hire a car. , she could hire a car. 4. If it wasn't for Peter's advice, I don't know how we would have managed. , I don't know how we would have managed. 5. If they hadn't gone to the same university, they might never have met. , they might never have met. 6. She might have found him rather attractive if he wasn't such a prig. She might have found him rather attractive . 7. If Sam's not in the office, he's probably in the coffee room. , he's probably in the coffee room. 8. If it hadn't been for Samantha's brilliant idea, this success story would never have happened. , this success story would never have happened. 1. He would be there now if he hadn't missed his train. He would be there now . 2. We could expand our operations if the current climate wasn't so difficult. We could expand our operations . 3. If I'm not there when you arrive, please ask for my assistant. , please ask for my assistant. 4. If she hadn't failed that exam, she wouldn't still be at university. , she wouldn't still be at university. 5. If the company was prospering, we would be able take on more staff. But, as you know, that is not the case. , we would be able take on more staff. But, as you know, that is not the case. 6. We can meet inside the cinema if it happens to be raining. We can meet inside the cinema . 7. We think it would be better if the candidate reapplied after gaining some more experience in the field. We think it would be better after gaining some more experience in the field. 8. We could have had serious PR problems if it hadn't been for the excellent way Martin handled the press. We could have had serious PR problems Martin handled the press. In the examples with should we've seen so far, all the original if-clauses have been in Present simple. But if the verb is another aspect: continuous, perfect or perfect continuous, we follow the same form after should. See if you can work out how to do it. 1. If you're free later on, we could go for a coffee. , we could go for a coffee. 2. If she's working today, she'll be in her office. , she'll be in her office. 3. If he's finished the report, I'll send you a copy. , I'll send you a copy. 4. If they've been travelling all day, they'll be feeling pretty tired. , they'll be feeling rather tired. Inversion seems possible with nearly all unreal conditionals, Second, Third and Mixed. With real conditionals, however, things appear to be a bit more complicated. So we'll now have a bit of a closer look at real conditionals. As I said earlier, we can't always invert Real present /future conditionals or all First conditionals. If you meet him, you'll see what I mean. If you should (by any chance) meet him, you'll see what I mean. Should you ( by any chance) meet him, you'll see what I mean. If they should (happen to) be interested, we'll send them a price list. Should they (happen to) be interested, we'll send them a price list. If she should (chance to) see Peter, she'll pass on the message. Should she (chance to) see Peter, she'll pass on the message. If you do the washing up, I'll put the children to bed. If Jim lifts that end of the table, I'll lift this end. If your friends are hungry, there's plenty to eat in the fridge. If your friends should be hungry, there's plenty to eat in the fridge. Should your friends be hungry, there's plenty to eat in the fridge. Should you to want catch the 4pm train, you'll need to leave now. Although still using should, were and had, there are a couple of exceptions to the rules above. I've never seen the second two mentioned in any lesson on inversion in conditionals and I don't think these would ever come up in an exam. I'm certainly not suggesting you should try using them, but you might come across them in a book or text of some sort. We sometimes use a Second conditional to make a suggestion more tentative or polite, in negotiations for example. 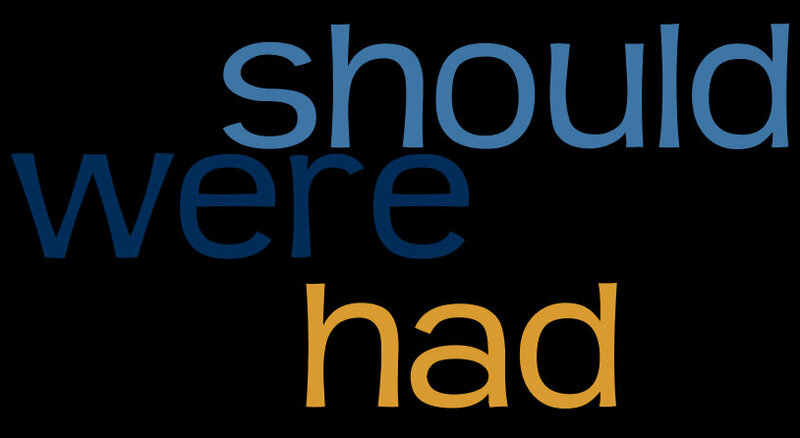 In these cases we can sometimes use should and inert with should instead of were (to). If you increased your order, we could consider free delivery. If you should increase your order, we could consider free delivery. Should you increase your order, we could consider free delivery. We sometimes invert the verb have for possession in second conditionals with had rather than were when the condition is definitely not true. If I had the inclination, I would work harder; but I don't. Had I the inclination, I would work harder; but I don't. If we had the necessary time and resources, we could go ahead with this project. But unfortunately, we don't. Had we the necessary time and resources, we could go ahead with this project. But unfortunately, we don't. If I had to choose between the two locations, I think I would select Spain. Had I to choose between the two locations, I would choose Spain. If we had lunch earlier, we could start the meeting at 1.30. Were we to have lunch earlier, we could start the meeting at 1.30. Sometimes a construction with were to have + past participle (3rd form) can be used instead of had in a third conditional. This can suggest that something is even more hypothetical or sometimes suggests that the consequences would have been very serious. We can invert this with were. If the police were to have found out, he would have been in trouble. Were the police to have found out, he would have been in trouble. Sometimes we use will and would in the if clause to make a request or order more polite. If you will just fill out this form for me. If you would follow me, please. Will you just fill out this form for me? Would you follow me, please. Postscript 2 - Were I you, ...? I've seen examples of Were I you, ... on a couple of websites, for example - Were I you, I would stop smoking. I have to say that this does not seem to me a very natural sounding sentence. Firstly, we have a very strong existing standard expression - If I were you. Secondly, this seems rather formal for what is really a bit of personal advice. And thirdly, I don't think we often use inversion in very short clauses like that, although admittedly - Were I in his shoes, I would behave differently - sounds fine to me. If we're to catch the 14.00 train, we'd better leave now. They'll need to work a lot harder if they're to pass the exam. We can't invert are to in the same way as were to. Amazing post! Thank you for publishing all this! BTW, are you on Twitter? Hi Baiba, thanks. I think I have a Twitter account, but I never use it. But I do have a look at yours from time to time. This post really helps me teach at school. I can learn a lot of things that I've never known before. It's about the inversion of "are to"
You say that there is no inversion for "are to"
so we don't have to do any inversion with this sentence, right? Please answer me as fast as you can. "If we're to catch the 14.00 train, we'd better leave now." "They'll need to work a lot harder if they're to pass the exam." "They'll need to work a lot harder should they wish to pass the exam." Thanks for the comment. It makes it all worth while. Hi! Thanks for your post. It's really helpful! I wonder if we could use inversion in the following sentence: "Would you mind if I opened the window?" Can we change it into something like "Would you mind were I to open the window?" Please help me with this! Thanks in advance! Hi, Queen of the Night - I would say it would sound very strange, and would avoid it. I've checked a couple of big reference grammars, and although they don't mention reversing clauses, in all their examples, the inverted clause comes first. "I would love to help you. Had I the time (that is)"
"I'd tell him the truth. Were he to ask (that is)." Secondly, "Would you mind if" is such a strong standard expression that changing it would be strange. There are at least 440 instances of "Would you mind if" at Google Books, and none for "Would you mind were", and at the British National Corpus 26 for "if" and none for "were". I think in this case we should agree with Mrs Beddington. You can read the extract here. 'Would you mind were I to' is on the second page. Thanks a lot, Warsaw Will!!! I really appreciate your help!!! Whoever's written that, I want to tell him/her thanks tons of times ! Never before have I seen such a spectacular view. Merci beaucoup from Switzerland ! kindly help me. How can one you rewrite the sentence? Thank you for the great exercises and explanations! It is one of the best blogs. keep up the good work. Thank you so much! Super useful! Thanks a lot!! It's really useful, clear and easy to understand. Very useful and clear explanation. @Ana Dueso - Hi, it's designed to print off each exercise separately. Sorry if that's not what you wanted. Thank you for your thorough explanations! Are these 2 sentences correct in using inverted sentences? This would seem to be grammatically possible, but to be honest, inversion with “have” as the main verb is not common, especially in the negative. In fact I can find no examples in the internet of “had I no friends” being used in a conditional. That seems to work, but remember, I’m just an ordinary English teacher, I’m not an expert on writing style. And this is more about style than correctness.